The issue of the appointment of Dr. Indrajit Coomaraswamy as the Governor of the Central Bank is a defining one. It is an issue on which one has to stand up and be counted. It is a moral issue; one which concerns the kind of Sri Lanka one wishes to have. It is also a larger issue of values; of what values one holds higher than others. It is an issue of ethics, of how one should or should not conduct oneself; of whether or not fair-play counts. Finally it is an issue of common decency. If there is any one thing that has been wrong with this country, it is the deviation from the principle of sheer merit, i.e. of sheer expertise and ability. The principle of merit itself is only a reflection of a more important criterion, that of fair play and natural justice. Going by the criterion of merit, Indrajit is ahead of the competition, with Saman Kelegama running a fairly close second. While the de facto Leader of the Parliamentary Opposition, Dinesh Gunawardena, has demonstrated his typical civility and decency by welcoming and commending Arjuna Mahendran’s replacement by Dr. Indrajit Coomaraswamy, some elements of and around the Opposition have attacked the appointment in tones that cannot but be described as raucous if coded racism. 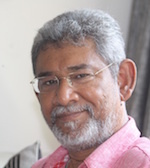 Vidura Wickremanayake and Vasudeva Nanayakkara have taken the same stance as Dinesh. All of them have impeccably anti-UNP, progressive, radical and anti-imperialist records. It may be true that in a deplorable lapse of judgment, Indrajit was associated with Raj Rajaratnam’s company, and Raj Rajaratnam was indubitably a financier of the LTTE apart from being a crook. He was a worthy successor of Emil Savundra. I didn’t know of the rumored Galleon connection, and I trust Indrajit will issue a full clarification about that ill-advised relationship and/or be grilled about it in parliament, but being the “honorable schoolboy” (to borrow Le Carre’s phrase) that Indrajit has always been, he was probably suckered because of his naiveté. However, guilt by association is not the most valid of criteria for evaluation and judgment. That tenuous affiliation with Galleon and Rajaratnam is by no stretch of the imagination the main thing about Indrajit. As Jean Paul Sartre said about Paul Valery, “he was certainly a petty bourgeois intellectual, but not every petty bourgeois intellectual was Paul Valery…” When the world judges Martin Heidegger or Carl Schmitt, it is for their intellects and not their tangential affiliations. The point is that in the case of professionals, academics and intellectuals, their affiliations are not the main criteria. The quality of their professional product and performance– of their minds—and the expert value they add, is or should be the main criteria. Only then can a country modernize, progress and advance. It is this criterion of sheer expertise and specialized competence that made Lenin and Trotsky absorb top officers of the oppressive Tsarist army, into the revolutionary Red Army even during the Civil War. In any case, I can state after a friendly acquaintanceship of over three decades (as long as I’ve known Rajiva Wijesinha, a common friend), that Indrajit has never shown the slightest trace of sympathy to the Tigers, or separatism or the political activism of the Tamil diaspora or indeed the cause and ideology of Tamil nationalism in general. Indeed his early Marxist formation together with his cosmopolitan upbringing and social background made him almost blind to ethnic identity even after the seismic shock of Black July 1983. If anything, he has always had a hyper-rationalist recoil against the ideology and politics of ethnic identity. In 2015, when the imminent appointment of Arjuna Mahendran was already drawing fire, I went on TV more than once, saying that Dr. Indrajit Coomaraswamy would be the best choice for the job. He had been shortlisted at the time, but wasn’t the PM’s final choice. I am delighted that over a year later, Govt. has come round to my publicly stated view, and the criterion of merit has prevailed. Not since Dr. Warnasena Rasaputram and Deshamanya A.S. Jayawardena has our Central Bank had as intellectually solid and suitable a Governor. 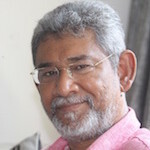 The Prime Minister stuck to Mr. Mahendran almost to the bitter end, and then attempted to implant another longtime confidante and old school pal, Charitha Ratwatte. All credit to President Sirisena– and if she played a role, to ex-President Kumaratunga– for the choice, however belated, of Indrajit Coomaraswamy who has for years belonged on my private short list of the most intelligent, and might I add, civilized, Sri Lankans of my current personal acquaintance. Even on vital economic policy issues, Indrajit is by far the right man to have at the helm of the Central Bank. Within the current Establishment, the decisive, perhaps determinant, economic importance of China is most easily comprehensible by Dr. Sarath Amunugama, the man who should be our Foreign Minister (with Mahinda Samarasinghe as Human Rights and Reconciliation Minister), and Dr. Indrajit Coomaraswamy. The only advice I’d give him is not to allow economic and financial orthodoxy take him too far from his intellectual roots which would remind him of the determining realities of a socially embedded Political Economy. The ultranationalist tendency of the Opposition seems to have fallen prey to the political sin that Mao, a philosopher as well as a master strategist, condemned and rejected as “whateverism”: whatever your side does is by definition right, while whatever the other side does is by definition wrong! If a civilizational fault-line in the Opposition is not to open up, and if a fissure between moderates and chauvinists, progressives and ultranationalists, modernists and traditionalists, pluralists and neoconservatives, the reasonable and the raucous is to be avoided, the Opposition must not stoop so low as to pick up every possible stone from every possible dung heap, to throw at the government. Instead it must take the high road, to the moral high ground. It must stand for the national, state and public interests, in the broadest sense, using the most advanced and enlightened criteria. That is the true meaning of progressivism. Patriotism is one thing, chauvinism quite another; nationalism has its place, but chauvinism must not. Instead of stepping into the gutter, the Opposition has a much faster highway to take to defeat the Government if it wishes to, and to do so within a matter of months. It was from Beijing that I followed Brexit with the clear realization that just as David Cameron and Jeremy Corbyn, i.e. a bipartisan consensus of Conservatives and Labor, had been defeated, it is perfectly feasible to beat a Ranil-CBK led UNP official SLFP-TNA bloc at a referendum over a non-unitary Constitutional change, falling well outside the 13th amendment. The quasi-federalist campaign in Sri Lanka would depend on the Northeastern and minority voters, but in the UK, Scotland, Northern Ireland and London all voted to remain. Yet, they lost. In the UK, the blowback has been the threat of a secessionist second Scottish referendum. The Tamil nationalists may get ideas (don’t they always?) but here in Sri Lanka, there is no EU equivalent to join, no second referendum nor referenda which can be activated by Provincial Councils. In the UK, the Leave campaign was spearheaded by two mavericks, Boris Johnson and Nigel Farrage. Here in Sri Lanka the NO campaign would have such figures further down the batting order, while the nationalist ‘NO’ campaign would be captained by the equivalent of a Churchill or Maggie Thatcher. The point I seek to make is that it is perfectly possible and indeed far easier to hit a government hard and topple it if an opposition or resistance movement is both radical and rational, militant while on the Middle Path, occupying the moral high ground and seen to be doing so. Fanaticism will never do more than assuage the militant element of one’s own base, while proving an obstacle to winning over the middle ground and the new, undecided voters. The forces of patriotic popular resistance must be more ethical than the Government; not more fanatical and fundamentalist. This is why Fidel Castro and Sandinista leader Daniel Ortega triumphed (and the Cuban and Nicaraguan revolutions remain quintessentially undefeated) while Pol Pot, the LTTE, the JVP, Al Qaeda and ISIS have failed. Dayan you are descending more and more into the pits. “It is a moral issue; one which concerns the kind of Sri Lanka one wishes to have.” Well when did morality play a role in your mind DJ? You to this day stand up to the utter degeneracy of the MARA Mafia. “It is also a larger issue of values; of what values one holds higher than others.” I wonder what your values are when you stood up in the podium at Nugegoda and demanded MARA be reinstated. “It is an issue of ethics, of how one should or should not conduct oneself;”. Where does your ethics emanate from DJ being a lapdog of the MARA clan of rogues. “If there is any one thing that has been wrong with this country, it is the deviation from the principle of sheer merit” What a proclamation from a man who supported MARA who had naught but rogues in the highest of places. “Vidura Wickremanayake and Vasudeva Nanayakkara have taken the same stance as Dinesh. All of them have impeccably anti-UNP, progressive, radical and anti-imperialist records.” Really DJ? They are also closely associated with the most successful roguish clan in Asia to this day. Talk about impeccability – you should know DJ. Like the waters rise up in a flood, the numbers of the commentators are often plenty to any of the write up of this particular creature that cough only for MR s hapankam. But most of these commentators are fully against him. Why ? There should be something in buggers charactor that people dont like at all. I have never seen any articles from anyone than the ones written by this Mr Proclaimed – Egomaniac of the country. Comarasamy might be a very good chap. But, trouble is, his appointment comes too close on the heels of Tamil Mahendran screwing us off our money. On top of that, he has connections to the LTTE-Raj Rajaratnam Galleon’s group. So, it quite a risk GoSL is taking. And for what reason, we can’t fathom, especially in the light of all the unrest. 1)	Comarasamy knows how to legitimize the financial-algorithm to initiate little egalitarian Sri Lanka into the Indian Common Market. 2)	Comarasamy knows the linkages of that certain diaspora, so they’ll invest further in the Dravidian Common Market. The purest of the pure blooded Sinhalese Cabraal didn’t missed a beat either, eh? Nothing ever done by the great patriot, the saviour, the messiah, the gift from Budda, the great lover of the nation, ………… is wrong, eh? Raj Rajaratnam is just small fry, only the tip of the iceberg. The convenient dark bogey-man for the pale-skins to get away scot-free. Living in the promised land, when they read you the gospel according to The White Shoe Boys all what a poor immigrant can say is Amen. I pity the poor immigrant who wishes she should’ve stayed home. LTTE-laden-RR wouldn’t be in prison if the pale-skins found him convenient, would he! But with current GoSL traitor-ism, Christian based pale-skins are getting ideas and working it to their advantage, aren’t they! No…..glad to be out here so I can see things in greater perspective. Grandma from muduku club- brain drain. Talk the talk with `human dignity` not hearsay amplified to venom. No worries, Ramona has her health problems. She may be suffering from Demencia – why i am telling this is .. time to time, she behaves so strange. Let s hope her sooner recovery.. She already concludes Arjuna as a thief. I still believe his innocience at least proofs are on the table. Ramona – an another punnaku eater ONLY. How do you know that Mahendran screwed us off as you confirm ? Who to believe here ? Investigations are underway. COPE is not a legal body to convict him. AG may be an another experienced man, but not a genius to categorically draw conclusions Arjunas decisions made billions of losses. And the fact new systems to show transparency was introudced by Arjauna after him being apponited to the CB. Earlier they had been no the like of auction system whatever being decided by Cabral by his own. Two categories fight for their causations. 1 Monsanto the manufacturers and their researchers… they prove the other way around that Glyphosat is no means a threat to health of human beings- since it is a biozid. What does a karapotha living in Yankee Land know about Sri Lanka and its economy? Sri Lanka has NEVER EVER been Egalitarian and will NEVER EVER be one even in the next 1000 years. Just cut the crap and take your pills on time. Ramona therese’s chair which she uses for writing comments has an 8″ long screw bolt projecting up from the seat! And the fuckress can screw up the whole internet backbone when she begins buttfucking! It is a disqualification for Indrajith to get such a write up from an utter idiot like Dayan ! When will this egomaniac stop trying to take credit for everything that has even a semblance of being correct and when will he stop trying to undermine Ranil ? It is an insult to a great man like Indrajit Coomaraswamy when a dishonest and selfish man like Dayan who does not know the meaning of integrity say it was he who first recommended him. Indrajit Coomaraswamy is one of the greatest Economists that Sri Lanka has produced during the last 60 odd years. The Coomaraswamys were an immensely powerful aristocratic family in Sri Lanka and to this day, the family continues to be respected across the island and its members continue to hold high positions. As I feel there is nobody in the country to feel so egomaniac as DJ. Almost everyone laught at him -but he is still miles away from getting it. “… but being the “honorable schoolboy” ..that Indrajit has always been, he was probably suckered because of his naiveté.” Ok, I’ll go along with Dr Jayatilleke’s “innocent until proven guilty” viewpoint. Compared to the crook who was there before, the man seems qualified and has distinguished academic and athletic credentials. The main role of the position is implementing monetary policy, public borrowing and providing regulatory oversight, which he must execute impartially without favour or intimidation, something which is exceedingly difficult to do in today’s political environment. Ananda-USA: You must be experiencing a “NEW” life wave after venturing out of Lanka Web and entering into CT. Please don’t feel that uncomfortable with “Thumbs Downs” and other comments as regards your “Sinhala Buddhist ONLY” approach to problems facing Sri Lanka. You need, I believe, a well informed and knowledgeable gathering at CT to BROADEN your outlook in matters of politics, economics, social etc. that directly affects the people of this country. So please remain connected with CT. It will definitely be a thrilling experience. Ananda-USA has posted the same piece of typing in Lanka web too, a natural habitat for a bigot. He/she has been around for quite sometime. I have seen him in Economist floating like scum and stink like rotten garbage. I think these people though abhorrent in their thought, words and deeds, add spice to otherwise boring spat outs. The Same thing was told about Wigneswaran by this Dumb Dayan. I totally disagreed with an appoints I Kumarasamy ,because he not competent person for such overall the economic operation and development of sustsnibility capitalism in an Island. He past records shows very much that I.Kumrasamy is closed to more or less back by Tamil Diaspora. That will be conflict interest of political and economic sovereignty of Sri Lankan an Independence which that survival of nation . We are few democrats in developing countries in third world nations. We cannot entertain, Anti-democratic and anti-establishment person in sensitive place like CB as well as our republic. The CB of Sri Lankan is heart of Capital and Monterey market of That the Market Capitalism. This key institution cannot be handover to I.Kumarasamy who has been NOT builds such confidential of very credential for our people’s future. The issue is not that he Tamil or non-Tamil are not related at all! He lost majority People confidence by his past deeds. I Kumarsamy is not an option for the Bond corruption operation by Arjuana Mahadran of Ex-CB governor who has been that totally undermine and destroy CB that the principle system of operation more than 18 months by blessing of UNP-Ranil W…..
A Mahanadara escape without any charges against that he is above law of Sri Lankan by UNP set of rule of “good governance and rule of law” of Ranil W… oriented “democracy”. You and morals? when did you see that connection? Goosy Goosy Gander…..Where Do You Wander! It’s quite a treat to see a Central Bank Governer appointed by the President, approved by the Prime Minister and also by Dr. Dayan J himself, a close friend. .
All at once people are jumping up and down attacking, defending, slandering and character bashing. Many have seen that Sri Lanka is divided – it is divided and always will be divided whatever anyone does. Thanks for proving them right. BTW the fact that we have a Central Bank Governor who is a Tamil is also a huge problem to some, never mind that “Racist-Chauvanist-Dayan J” is one of his staunch supporters. Maybe Dr. DJ should have written some racist diatribe about the Good Governer, would you have liked that? Many PHDs are awaiting those who can figure out Sri Lankan politics. Phd in psychology community medecine, community mental health. OH DJ, you are again on it! If I understand this article, there are two things to be noticed. 1. DJ has recommended IC already a year ago for this post but no one has listned to him; now he feelshimself heard because after all these trouble with CB and Mahendran the prez. realized that the recommendation of DJ is the right choice. 2. He wanted to bring to our notice that he was in Beiging during the recent Brexit vote and observing the developments in UK, and if he is asked or if necessary he may be in a position to advice Cameron, Johnson, Gove, Corbyn and Co. Unfortunately nobody seems to care there about what this bloated good for nothing political analyst has to say. He praises the new governer rightly for his qualifications but want to check his credentials in the Galleon affair, because the owner Rajaratnam is sitting in US jail for his finacial frauds and suspected to have connections to the LTTE. Of course this connection is not proofed without any doubts. But the connection of DJ to the former GOSL is official and known to the world, whereas this former regimes name is not yet cleared of its role in the last few weeks of the war and there are inquiries still pending and a UN-resolution in place. Our friend DJ is however involvedin all these matters as he tried to buy the then regime free in the UN. So the qustion is what shall we do about a former diplomatic staff, who eventually lied knowingly in the UN? is he a nationalist, criminal, bootlicker? I am of the opinion, if in an independent inquiry if it should be proofed that the former regime was involved in HR violations, in the worst case senario in geonicide then would DJ be part of this criminal complot? And since IC was not making much noice after July 1983, he is acceptable for the post. What is it, if he chas condemned the attack on the mob and the then govt. would he not go through as a rational common man? this is putting DJs racism through the back doors. Other than that IC’s sister Radika Coomaraswamy is a partner of DJ in questionable political streaming, we have not yet forgotten that DJ! By the way he tries to buy out the JO nationalist as civilized, decent and big democrats is a nice try, but he should be shamed for their acquaintances. “When Sir John Kotelawala was the Prime Minister of Sri Lanka, he arranged a banquet for the British Bank Governor at the Temple Trees for which the Central Bank Governor at that time N.U. Jayawardena was also invited. While the dinner was in progress, Sir John suddenly flew into a rage at N.U. Jayawardena, and said, “I say, I am informed that you are earning a lot from the Central Bank monies”. This made NU’s face to turn red. “You’d better understand I can probe your foreign assets under the Foreign Exchange Act,” NU yelled at Sir John. This was the first Sri Lankan Governor of Central Bank. Who was defending him at that time; another assumed “Pukka Sahib”; J.R.Jayawardene. Since then, I haven’t read any controversies about other CB governors until Cabral was brought to CB by Mahinda Rajapaksa. Many volumes have been written about Cabral and Rajapaksa regime on the topic of financial frauds in the country. The bottom line is Cabral is alleged to be a crook and fraudster. The only difference is that Cabral and Rajapaksas were never treated as “Pukka Sahibs”. After Rajapaksa regime was dumped in January 2015, the best promoted Pukka Sahib of the country, introduced another assumed Pukka Sahib club member Mahendran, he is alleged to be a financial fraudster too. His alleged activities are well published and documented, but the governing politicians were adamant and reluctant to fire the fellow. So called COPE was sitting on it for the COPE members it was not an very important issue. Who came to defend Mahaendran ; Ranil Wickramasinghe just like his uncle J.R Jayawardene did in the case of N.U Jayawardene. But my dear fellow readers, the stark difference is Ranil is no Sir John Kothalawela, Neither for that matter Maithripala Sirisena. Unfortunately, it looks like current politicians were looking for another outsider of the caliber of N.U.Jayawardene and Mahendran to handover the coveted job at CB. They found an ideal candidate and they were satisfied with the most important qualification/prerequisite; Excellent practical experience in advising fraudsters of financial crimes. Indrajith was a good match, not only he had academic qualifications he was from Pukka Sahib Club. So Indrajith was introduced to the nation camouflaged in “Pukka Sahib” sophistications. No one dares to challenge Pukka Sahib club members. They are very sophisticated in everything they touch. Unfortunately, for average Sri Lankan like us, there is no one like D.S.Senanyake, Dudley Senanayake or Sir John Kotalawela to challenge this sophisticated gang. For them, D.S, Dudley and Sir John were not “Pukka Sahib” enough. Just look around, what these fellows have given to us; Ethnically divided nation and a DEBT LOAD that cannot be settled by our grand children and their grand children. So my dear fellow readers, if you are not about to vomit after reading this piece of “ARTWORK” by Dayan Jayatilake, my only assumption is that our beloved country has to be beset by “fraudsters” and “wanna be fraudsters.” My sincere hope is I am wrong. IC himself stated that all he did was some macroeconomic work for Raj Rajaratnam. This can easily be verified and I have not seen anyone challenging the fact (other than you and your ill informed notions) Raj’s own brother didn’t know what the chap was up to, so by what association do you think Indrajith knew? If knowing a crook equals being a crook (by your twisted logic) then it’s very likely that you yourself are a crook, unless you have led the life of a hermit. Always a crook comes to save,or rescue another crook. Also, you do not have to live a hermit’s life to be free from corruption, Therefore, it is great if you do not malign others due to perhaps your own weaknesses. The article should be welcomed in many ways than one. In other ways it should be condemned because DJ talks decency and fair play. MR does not have even shread of fair play or decency in him and this where DJ’s opinion on the appointment falls apart. How dare you speak of Tamil nationalists and conveniently avoid Sinhala nationalism being led by MR. Isn’t quite obvious to you that the minority vote becomes decisive in a referendum or election which will decisive. To say that Tamil nationalist will have ideas then what do Sinhala nationalists have – perhaps no ideas, don’t they always ??? You have two faces DJ which you wear whenever it serves your PERSONAL interests ONLY. What is up your sleeve with such positive article of Indrajit is anybody’s guess ??? #yourslipalwaysshows. Here we go again, the meaningless ranting’s of a sycophant suffering with flatulence as a result of self importance which no one in his right sense pays any attention to. This messiah is living in the clouds of ignorant bliss and imaginary intellect. DJ, please continue to give your stupid advice to the Joint opposition who needs a few more clowns to fill their theatre. This group will be impressed with your archaic political ideology that was buried centuries ago.